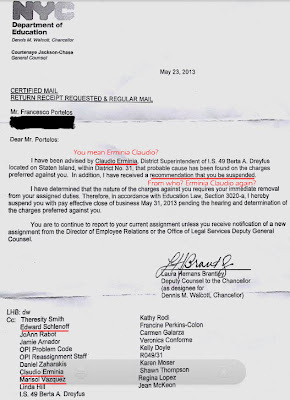 I believe that Ms. Laura Brantley meant to put Ms. Erminia Claudio, and not Ms. Claudio Erminia, in her email to Francesco Portelos? If not, please give me the title, contact information and authority of "Claudio Erminia" to find probable cause against Mr, Portelos. 1) All documents, notes, memos, emails, or recordings made when Superintendent Erminia Claudio contacted Laura Brantley, Attorney, about the matter concerning Francesco Portelos and his 38 charges, and/or probable cause in his case. Please see the letter attached from Laura Brantley to Francesco Portelos. 2) All documents, notes, memos, emails, or recordings made when ATU Attorney Laura Brantley contacted Superintendent Erminia Claudio about the matter concerning Francesco Portelos and his 38 charges, and/or probable cause in his case. 3) The name, title, contact information for any person who assisted either Laura Brantley or Eminia Claudio in "finding" probable cause for Mr. Portelos' 38 charges. 4) The name, title, and contact information for the charging attorney at the Administrative Trials Unit who wrote the 38 charges against Mr. Portelos. 5) The name, title, and contact information for the charging attorney at the Administrative Trials Unit who wrote the probable cause form. 6) The name, title, and contact information for the person(s) who recommended that Francesco Portelos be suspended with pay. 7) The particulars of what the title of Ms. Brantley means, specifically "as designee for Dennis M. Walcott, Chancellor", and any and all rules, regulations, or law which gives her this authority and title. 8) How Dennis M. Walcott has the powers and duties of "Chancellor" pursuant to law. If you have any questions relating to the specific record(s) or portion(s) being sought, please email me at betsy.combier@gmail.com so that we may discuss them. Ellie Rubenstein has had enough. Upon learning that she would be involuntarily transferred to another Illinois school, the former fourth-grade teacher submitted her resignation in the form of a video . In the 10-minute spoken resignation, posted on Youtube Tuesday under the username Iquityoucantfireme , Rubenstein explains why she is quitting and addresses several major problems she says she has faced as a teacher in the U.S. public education system. "I was proud to say I was a teacher," Rubenstein tells the camera, after describing how she abandoned a career in public relations to "do something meaningful" with her life. "But over the past 15 years, I've experienced the depressing, gradual downfall and misdirection of communication that has slowly eaten away at my love of teaching." "Raising students' test scores on standardized tests is now the only goal, and in order to achieve it the creativity, flexibility and spontinaety that create authentic learning environments have been eliminated. ... Everything I love about teaching is extinct," she continues. Rubenstein's resignation stems from a dispute between four Lincoln Elementary School teachers -- Rubenstein included -- and North Shore School District 112 administrators. As Highland Park News reports, Rubenstein and her colleagues received letters detailing their mandated transfer to other schools in the district and were given 21 days to respond. In the video, Rubenstein states that the letter cited a "poor climate" in the building as the reason for her involuntary transfer. 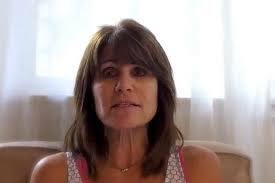 "But the truth is, I'm just not a 'yes man,'" she claims in her video. Administrators contend, however, that such a transfer is not used to punish teachers, Highland Park News notes. 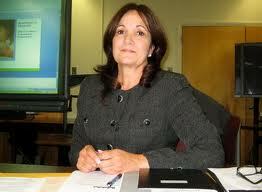 Rubenstein's resignation and the teacher transfers will likely be discussed at a school board meeting Thursday night. Pamela Kramer, president of the North Shore Education Association teachers union, said the district did not violate its contract . Nevertheless, she expects the meeting to draw a crowd, according to The Chicago Tribune. Earlier this year, a New York high school teacher's resignation garnered widespread attention on social media after he posted the letter on Facebook along with a photo of Porky Pig saying, "That's All Folks." "I am not leaving my profession," Gerald Conti explained in the letter, "in truth, it has left me. It no longer exists."